With most of the snow and ice behind us, it’s prime time for Omaha residents to inspect their sprinkler systems for any damage that may have occurred over the long winter. It isn’t uncommon for some of the pop-ups and spray sprinkler heads that worked just fine last year to need maintenance now. Most residential sprinkler installations in Omaha include a variety of pop-up spray heads arranged in zones. While some of the heads spray in a circular or arc pattern, others are designed to rotate for better coverage of the designated area. The three basic types of pop-up heads include stationary, rotor- or gear-driven. For some Omaha homeowners, the way they find out a sprinkler head isn’t working is when a section of their yard dries up and turns brown or becomes flooded. The great news is that you don’t have to let it get to that point to identify non-working sprinkler heads. There are actually a few things that can signal that a sprinkler head isn’t working optimally, or at all. It is common, especially in the Omaha-Metro area, for pop-up heads to become clogged with yard debris or dirt. To identify if a clog is present, look for a spray that is interrupted, uneven, or non-existent. You may see water pooling around the head. To clear a clog, you can try inserting a piece of wire into the opening. If this doesn’t work, you may need to lift it from the sleeve and give it a more thorough flush with running water. Don’t forget to turn off your system before removing the head for cleaning. If you chose this method, please use caution to not break the sprinkler head. For optimal care, we recommend you to contact our Lawn Care Professionals. If it isn’t clogged, you’ll want to look for signs of a stuck valve, which can cause your sprinklers to continue running even after they are supposed to shut down. Most residential systems have two valves (one at each end). Check under the cap-like structure (called a solenoid) to see if a rock or chunk of debris is blocking the valve from closing. Sometimes you’ll need to take apart the valve, which is comprised of several small working parts. This is where it can be best to call one of our Omaha Lawn Care Professionals at (402) 934-8866 help solve your problem! It is also common to find sprinkler heads that are broken from weather, mowers or edging equipment. In this case, replacement is required. While it is possible to “do-it-yourself,” you’ll want to be sure to select the same type of head, as well as one that matches the inches-per-hour (iph) or gallons-per-minute (gpm) requirements of the old head. Also, you will want to ensure the spray patterns and throwing distance matches for the new head to perform optimally for the zone you’ll be replacing. Do your sprinkler heads leave you scratching your head? 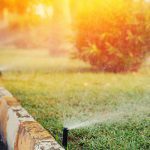 Above & Beyond CGM has dedicated Omaha Lawncare Professionals on staff who can answer your questions about your home’s lawn sprinkler system and more. Just give us a call at (402) 934-8866, and we’ll get you squared away.